If there was a closet poet in York’s Court of General Sessions in the 1730s, he or she apparently only struck once, at least publicly. And no one can figure why the routine assault case of an old, drunken millwright moved the poet to describe the case in verse. He was a millwright by his trade. He got so drunk he scarce could stand. Did beat and bang poor Sam, his son. And send him to the shades of death. Was the poet Noah Emery, the King’s Attorney who would have prosecuted the case? Possibly. But the poet expresses sympathy for the younger Sam Cole, and speaks harshly of the father. And it was Emery who moved for dismissal of the charges against old Sam Cole. Perhaps the author was a court clerk who had time to waste in a quiet rural courtroom on a cool October day. Or perhaps it was someone else who worked in the courthouse. “It had to be someone with access to the records,” said Arthur Dostie, the archivist who stumbled across the poem two years ago while sorting old York County court records. In manner as he did before. Threatened to kill him with a gun. By’s maker he would shoot him Slam. Those other crimes were not confined to that summer of 1734, apparently. Dostie has been through page after dusty page of those old court records, and Sam Cole’s name pops up frequently. But although Cole was a repeat offender, it appears that drunken rowdyism wasn’t considered serious enough to go forward with a trial. The dismissal of the charges is also described by the poet. To those offending in like sort. It often times has been his fate. For ‘tis no breach of any law. 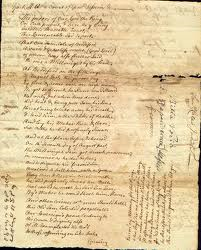 The court papers, on the other side from the poem, show that Cole paid court costs and was released. 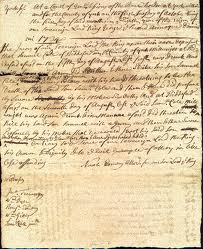 The unknown poet may have finished that afternoon in October 1734 by dipping his pen and composing his poem. And not far away, Old Sam Cole may well have celebrated his freedom with a drink or two.